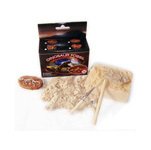 Treasure is more fun when you get to dig it our yourself with excavation tools. Surprise rocks and minerals lay within in each kit, waiting for kids to excavate and discover. 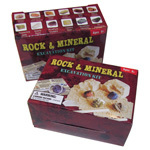 Contents may include desert rose, leopardskin jasper, yellow jade, fibre gypsum, tigereye, zebra jasper, serpentine jade, quartz points, amethyst clusters, iceland spar, snowflake obsidian, green aventurine. Learning can be fun! 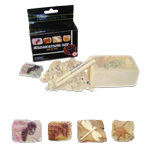 This range of educational toys allows curious minds to use their imagination while digging for buried treasure. 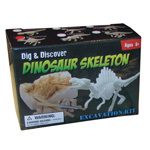 Dig It Out kits are fun and make unique party favours, they're great for science class, plus they are a great option for corporate team building sessions.